Curried Tempeh & Veggie Wraps with "Chutney" Curried Tempeh & Veggie Wraps with "Chutney"
One of my favorite “go-to” vegan-meets-non-vegan-for-dinner restaurants is Oasis Cafe in Salt Lake City. Their menu offers both meat, vegetarian and vegan entrees (clearly marked on the menu) and many other dishes can be altered to exclude meat and dairy. Kel and I went there the other day for lunch and instead of getting my usual tempeh gyro – which I normally cannot resist – I ordered the curried tofu wrap. I was delicious, but I kept thinking it could’ve been better. Not so much better, but more. As in more flavor. It was as if they got all of the parts right, but the complete package was lacking something. It became my challenge to try and make a better version at home. Here, tempeh replaces the tofu and I went with potatoes and cauliflower instead of yellow squash. I just like ’em better. By the way, the list of VVP participants is looking mighty fine! Check it out here. To get your name added to the list, visit the home of the Virtual Vegan Potluck and sign up! Warm, flavorful, and slightly spicy wraps with a touch of sweetness from the “chutney.” Delicious served over brown basmati rice, too! Drain the raisins. Combine all of the ingredients in a food processor and mix until nearly smooth. Put the chutney in a small bowl and set aside. In a blender, combine all of the marinade/sauce ingredients and process until smooth. In a shallow dish, combine about one quarter of the sauce with the cubed tempeh, cover and refrigerate overnight. The next day, remove the tempeh from the marinade, reserving the marinade still in the dish. Place the tempeh on a baking sheet and bake for 20-25 minutes in a 425F oven, turning occasionally, until browned. While the tempeh bakes, prepare the vegetables. Combine the vegetables on a large baking sheet and toss with a few tablespoons of vegetable broth or water. Bake in a 425F oven, turning occasionally, until vegetables begin to soften. Remove the pan and stir in a 1/4 cup or so of the marinade/sauce. Return to the oven and cook for another 10 minutes or so – until the vegetables are very soft. Remove from the oven and stir in the tempeh. While the vegetables cook, warm the remaining marinade/sauce in a small saucepan. When the vegetables are finished cooking and you’ve combined them with the tempeh, pour the remaining warmed sauce over everything and stir to combine. 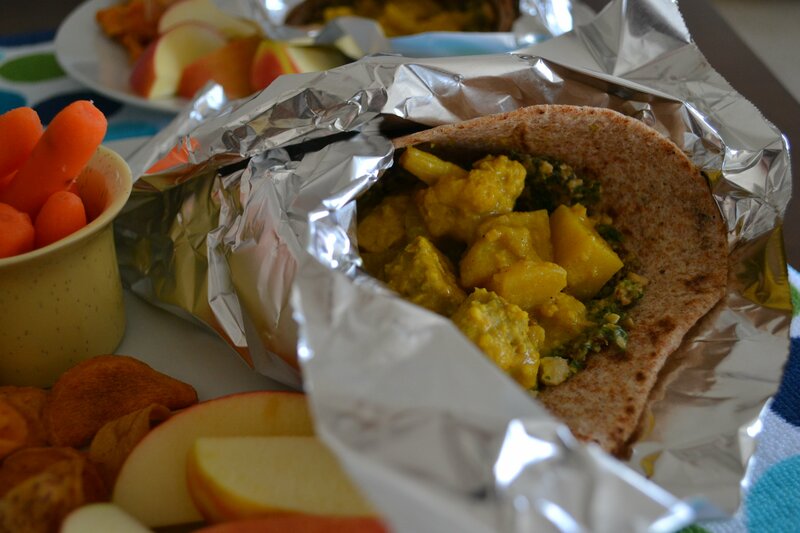 Spread the “chutney” on the tortillas or inside of the pita breads; divide curry mixture among the wraps, roll up and serve. That list and this dish are looking MIGHTY FINE! Girl, are you trying to outdo yourself? I thought we could take the weekend off with MOFO? No way I could do 31 posts!!! I’m peaking and pretty sure it’s all downhill from here ;-)! No ma’am, no can do 31 posts. I’m not a masochist! Mostly. Pshaw, you’re only getting warmed up…. 😉 20 posts, piece of unrefined vegan cake! Wow you are killing MoFo! So many amazing dishes, how do you do it girl? These look delicious and so satisfying! I love cilantro, especially when paired with a curry spice and creamy sauce! Awww, Gabby! You’re sweet – you really made my day. This looks simply mahhhvelous my vegan babe!! I love the spices and herbs. I love the yellow cauliflower! SO pretty. I just got a purple one from the farmers market this morning–I am super excited to use it, lol. Isn’t that the cutest?! I had to have it. Purple sounds way fun! The yellow cauliflower looks so cute! I was also so excited when I found a purple cauliflower in our market. It’s a kind of thing I never expect to see in Bombay! And I never thought of adding applesauce to chutney. Great idea! The applesauce was kind of a last minute addition :-)! It worked really well, however (phew!). This wrap looks so good and it looks like I could make the vegetables, tempeh, and chutney and then make a wrap for lunch each day. I love this idea! Ahh, then my work here is done! These wraps sounds so good! I love tempeh but I’ve never curried it for some reason. Super excited to try this out! I don’t think I’d tried it before either. I just kinda wanted something other than tofu! It works! Have you thought about joining the Virtual Vegan Potluck? You don’t have to be vegan; you just have to make a vegan dish. Great way to connect with bloggers. http://www.virtualveganpotluck.com. I’d love to have you join! You are such a whizzkid! I don’t think I’ve ever eaten tempeh. This looks like a most satisfying meal and the chutney sounds wonderful. I love that photo of the cauliflower. I really like tempeh, Lorna. It has a nice texture and unique taste. Very versatile. Can you get tempeh in Scotland? I’m sure you can get it here in wholefood shops, if not mainstream supermarkets. I’ll keep an eye out for it from now on.